It is Remodel Thursday and we have a great tip for you. Today, we are all about the kitchen sink. Are you ready? The kitchen may be the heart of the home, but the sink handles most of the daily chores. That’s because it’s the only working area used to both prepare meals and clean up after them. Although quality sinks can last 15 years or more, they do wear out. Their finishes start to dull or chip, and annoying leaks appear mysteriously around the rim and drain. When replacing the kitchen sink one could get overwhelmed with so many options — single bowls to multiple bowls of different sizes, shapes and depths — you need to consider the size of the room and how you’ll use the sink. Large multi-basin models, which are popular right now, will overpower a small kitchen. The National Kitchen & Bath Association, an industry trade group, suggests a standard 22X24-in. single-bowl model for kitchens less than 150 sq. ft. For larger kitchens, you can consider the added convenience of double and triple bowls that allow you to stack the dishes in one bowl while you rinse off vegetables in the other. 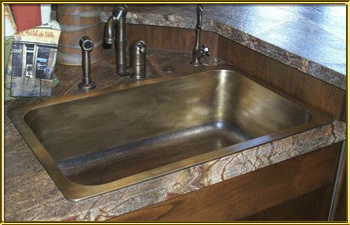 Many designers specify one main sink and a smaller bar sink for large kitchens. The added smaller bar sink, like the Cordial Cast Iron Sink by Kohler, works out well when there are 2 cooks in the household. It also works well if there are children in the home. Whatever size and bowl configuration you choose, you’ll also need to select the type of mounting you want. This is both an esthetic and a practical decision as described above. You’ll also need to specify the number of holes in the sink deck. This number will range from one to five, depending on the faucet and the number of accessories you will have like spray hoses and soap dispensers you add. Call us at 1-866-369-8180 and we will have one of our specialists speak with you. We are now accepting PayPal. For any orders that are over $99.00 you can choose to “Bill Me Later” and get 6 months interest free. We look forward to assisting you with any of your kitchen needs here at Plumbtile.